“Landscape Plants for Subtropical Climates” by Bijan Dehgan, published by the University Press of Florida. This praiseworthy book will be most useful in USDA hardiness zones 8 through 11. However, some species, such as certain agaves, are hardy farther north. Originally written as a textbook and laboratory manual for horticulture courses, its useful value is much greater than that. As the author indicates, many of the species are grown elsewhere as greenhouse plants in cold climates. The volume features many cacti and succulents that will be of interest to readers. It is intended as a guide to plant selection and outdoor use. Among the succulents included in the book are agaves, crassulas, echeverias, euphorbias, kalanchoe, portulaca, sansevierias, and yuccas. Of the cacti, it includes both jungle and desert species. The introduction begins with an explanation of botanical plant names, and pages featuring drawings to illustrate the different kinds of leaves and flowers. From that point, the author devotes a page for each plant, most of which are illustrated with a line drawing. For each entry, there is a Latin and common name, a guide to pronunciation, origins of the name, complete description, hardiness zones, details on propagation, landscape use, growing conditions, and comments. The plants are organized by family. At the beginning of each plant family, there is a page containing general information about those species, such as its geography, a general description of the family’s leaves, flowers, and fruits, growth habit, and economic uses. The author is professor of environmental horticulture at the University of Florida, and nationally recognized horticulture expert for his knowledge of taxonomy (the study of plant names), and for his experience with the endangered sago palms (cycads) and physic nut (Jatropha). In the appendix there is a glossary of the terms used in the plant descriptions along with selected references. With the index it is easy to find the plant you’re looking for, as it lists both common and Latin names. 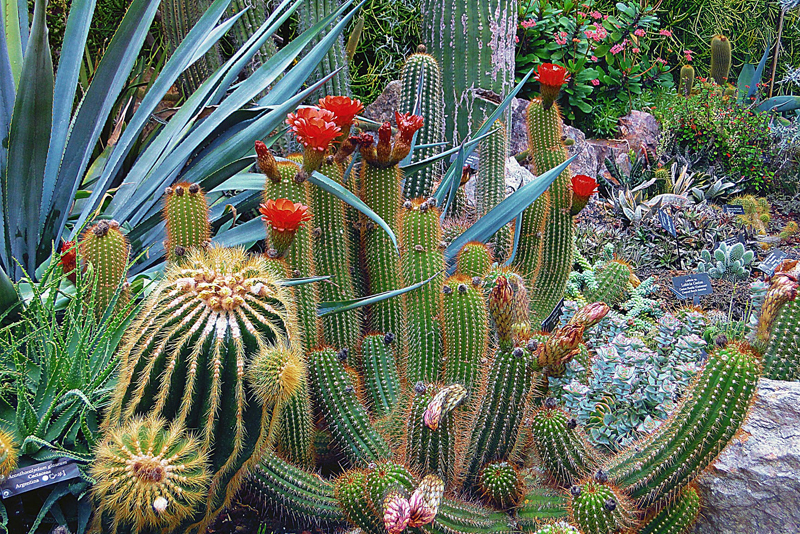 Cactus and succulent lovers in warm climates will benefit greatly from this book, while those in cold climates can also learn much about the greenhouse species.